BRP will be visiting 28 popular family boating meccas across the United States this spring and the Long Beach is the next stop. The Sea-Doo Life Test Ride Tour offers consumers the chance to experience the boating lifestyle and latest technologically advanced Sea-Doo watercraft and boats for free. Consumers can also register in the Share the Sea-Doo Life to enter to win a Sea-Doo GTX† S 155™ watercraft and MOVE iCatch trailer. 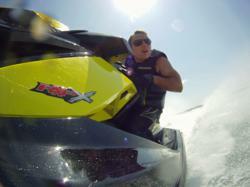 When: The Sea-Doo LIFE Test Ride Tour will be in Long Beach, June 1-3, 2012. Where: Long Beach Marine Stadium, 5255 Paoli Way, Long Beach, CA.